There will be no British referee at the World Cup this summer for the first time since 1938. Fifa has chosen 36 officials for the tournament in Russia but none from England, Scotland, Wales or Northern Ireland. Mark Clattenburg was the only Briton on Fifa's long list of officials, collated in summer 2016, from which it would choose the final selection for Russia. But he left his job with the Premier League and forfeited his place. Clattenburg, who took charge of the Euro 2016 final when Portugal overcame hosts France, quit his job as a top-flight official in February 2017 to become Saudi Arabia's new head of referees. The Football Association did ask world governing body Fifa to replace him with another official but it rejected the request. There are also no British officials among the 63 assistant referees selected, while video assistant referees (VAR) will be chosen from the pool of officials at the tournament. VAR is being used at the World Cup for the first time. The World Cup did not take place for 12 years after 1938 because of World War Two, and since it resumed in 1950 there has been at least one English referee at each tournament. 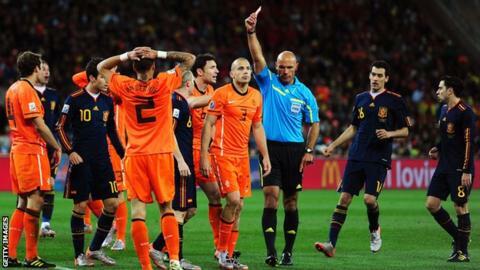 England's Howard Webb was Britain's sole representative at the last two World Cups in 2010 and 2014. He took charge of the 2010 final when Spain beat the Netherlands in South Africa. In terms of Fifa's international list, the Football Association and referees' association PGMOL work together to put forward their choices. The final decision is taken by the FA Referees' Committee and they nominated Martin Atkinson, Stuart Attwell, Robert Madley, Michael Oliver, Craig Pawson, Anthony Taylor and Paul Tierney for 2018. Arsenal manager Arsene Wenger has been a vociferous critic of Premier League referees this season and said they "don't work enough". He also said some referees are living in the "dark ages" with the way they treat players and described disputed refereeing decisions against his side as "concerning coincidences". The Frenchman was also given a three-game touchline ban and fined £40,000 for his behaviour in referee Mike Dean's changing room after a 1-1 draw at West Brom in which the Baggies were awarded a controversial late penalty. Atkinson was accused of making a "fundamental error" by former Stoke manager Mark Hughes, while Manchester City recently asked to meet the body responsible for Premier League referees - the PGMOL - to discuss their concern at tackles being made against them. Is Wenger right on refereeing decisions? Read more on Is Arsene Wenger right about refereeing decisions going against Arsenal?